Sister Berenice Beck was instrumental in establishing the College of Nursing at Marquette University, Milwaukee, and was appointed its first Dean. She was the first nurse in Wisconsin and among the earliest in the nation to complete requirements for a doctoral degree. Under her direction, the Code for Professional Nurses became a reality. Born Annetta Beck in St. Louis, Missouri, she became a postulant in the Franciscan Sisters of the Sacred Hearts of Jesus and Mary in 1910, taking her vows in 1913. She earned her diploma from St. Anthony's Hospital School of Nursing in St. Louis in 1915 and completed a B.S. degree from Marquette University in 1927 and her M.S. four years later. While attending school, she was assistant director and later director of St. Joseph's Hospital School of Nursing. In 1932, Sister Berenice moved to Washington DC to teach the School of Nursing at Catholic University and enrolled in its doctoral program, which she completed three years later. Returning to Milwaukee as director of St. Joseph's Hospital School of Nursing, she worked diligently for the integration of the school into Marquette University. This was accomplished and students were admitted to the College of Nursing in 1936. Sister Berenice served as its Dean from 1936 until 1942, and remained on the faculty for nearly a decade after that, teaching graduate courses. Active in professional organizations, Sister Berenice served as president of the Wisconsin League of Nursing Education (forerunner of the present Wisconsin League for Nursing) and on the board of the Wisconsin Nurses Association, as well as on numerous committees of national organizations, including the Catholic Hospital Association, the National League of Nursing Education (NLNE) and the ANA. She served on the ANA board of directors and on the board of the American Journal of Nursing Company. In 1940, when the NLNE began its school of nursing accreditation program, she was appointed a field visitor. Nationally, Sister Berenice is best known for her role in the development of the Code for Professional Nurses. Developing a code of ethics began as early as 1926, but it wasn't completed until 1949 by the ANA's Committee on Ethical Standards, which she chaired. Sister Berenice died March 1, 1960 at St. Mary's Hospital in Racine, Wisconsin and is buried in Calvary Cemetery in Racine. Cooper, S.S. (February 11, 1992). 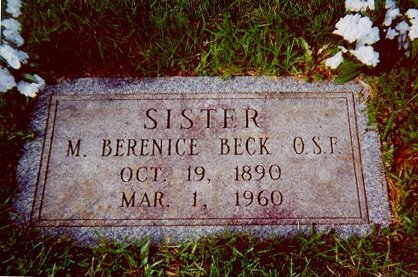 Sister Mary Berenice Beck 1890-1960. Nursing Matters. Madison, WI: Madison Newspapers. Cooper, S.S. (1988). Sister Mary Berenice Beck. In: American nursing: A biographical dictionary, Vol. I V.L. Bullough, O.M. Church, & A.P. Stein, (Eds.). New York: Garland.